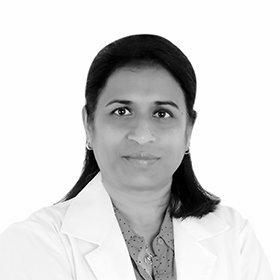 Dr. Savithramma Gunasekar has more than 20 years of experience in the field of Radiology and Imaging. She graduated MBBS from M. R Medical College, Gulbarga, Karnataka and MD (Radio-diagnosis) from Govt. Medical College, Mysore, Karnataka, India. She worked as Lecturer at St. John’s Medical College Hospital and KIDWAI Memorial Institute of Oncology, Bangalore. She has work experience in all modalities (USG/CT/MRI) of Radio Diagnosis. Later, she practiced as Specialist Radiologist in King Faisal Hospital Al Taif, KSA. She has worked as Consultant Radiologist in Kanva Diagnostic Centre and St. Therese Hospital, Bangalore, India.